Canadian Actor known for guest starring in a variety of tv shows like Stargate, Kingdom Hospital. On his website he Lists himself 5ft 11. This photo is from a Memorabilia event in 2007. Looks taller like 181-182 range, a strong 5'11.He might be closer to 181 than 180 in actuality so a solid 5'11 i believe is what he looks. It's a pleasure! I am now going to pop off to Gemma Atkinsons page to reply to you and Gladstone! I hope that Gladstone Screwer and myself have cheered you up by leaving comments for you on the page of Jenny Mcalpine, I actually answered your comment late last night! It is nice to hear that Christopher brought you some tea up to your room and this shows how good a person he is. My thoughts are also with Christopher too and everyone who was close to Manelia. There is nothing like having a sleep to recharge the batteries, I find that sleeping can be one of the most pleasurable things in life and it is a great feeling to wake up from being asleep for a few hours, well usually anyway! Sometimes it can have the opposite effect! Thanks for your kind words too Sandy, my Mum and I really appreciate it. @ Nik - Thanks so much to you Nik and your Mum for your comforting words. I was up much of last night, then had to get ready to go to the chemist for my painkillers. Jim picked me up and Led Zeppelin were playing in the car. The track which includes the lyrics 'speak to me only with your eyes' was playing and I really had to hold myself together, because that's what Manelia did all the time, apart from miaow a lot, of course! When I arrived home I simply went to bed with 5 of the cats and slept. I know you will understand that at this moment, I would rather leave talking about Manelia until later. I think of her all the time, and right now I am going to catch up on some comments. I woke up and my brother Christopher was there standing with some tea. I said, as I so often do when I wake, "Manelia!" She wasn't there of course and won't be ever again, save for in our hearts. Christopher is totally heartbroken as well. He loved her too. No one could help but love her. She was so funny and loving and if you said "Chatter," then she oblidged! My Dad thought that was great, too! I have noticed that you and Gladstone had comments on Jennie McAlpine and wish for me to join in, so I will go and do so! Thank your Mum as well for her kind thoughts. With all good wishes to you too. I want to say that I am really upset to hear the awful news about Manelia and that the thoughts of my Mum and myself are with you and everyone who was close her. You are being really brave by commenting on here when you are going through such a terrible time but your bravery does not surprise me because I know that it is something that you have in abundance. Manelia was such a wonderful cat and I feel really sad for you and I am in no doubt that watching television will prove to be really difficult at the moment, but I know that you and Christopher will be getting good support in order to help you get by at this terrible time. Obviously it is important that you stay strong for the all your cats and for Christopher and yourself too, I know that this is what you will do. I had an hospital appointment in Solihull yesterday and did not get back up North until about 3 o'clock and the 2 comments I sent yesterday did not make the comments page, but as I write Rob has put them on their respective pages. I will give Jasmin a hug from you next time I see her, thanks for that. I didn't read your comment until after I had arrived home yesterday and by that time she had gone home, she went home on Sunday morning. Also can you give your cats a hug from me too? @ Nik - Hi! It's good to see that you are having a family break and that ðŸ�© is with you. Give her a cuddle from me. On Friday Manelia got run over so I am very unhappy. I did a few posts yesterday and tried to carry on as normally as I could. She was the best cat ever. Jim said she was in love with me! I was certainly with her! She would sit staring lovingly at me for ages at a time! I can't believe what has happened and cannot even concentrate on TV programmes at the moment. Liv Tyler was on yesterday on BBC1 in Part 1 of a 3-parter called 'Gunpowder' that I had really been looking forward to but I barely took it in. There is a comment that I wrote to you, Rob and everyone who might have liked Manelia but I haven't seen that it's up yet. Right now, I am trying to take in a film with Morgan Freeman and John Cusack called 'The Contract'. I love both those actors so I hope it might stir some kind of reaction in me! Then perhaps I can do a comment or two. It gives me something to aim at and I remember back in June it help me when Peelio died,or more accurately, was destroyed by a careless speeding driver who shouldn't be on the road. One of Manelia's little eyes came out, to give you some idea of the accident, which I did not see. I go quite nuts to see my cats in the front garden anyway, but my brother lets them out. This afternoon I've had Livielia on my lap, who is Manelia's sister. Cats know, you know. All animals do, but my experience is with cats. Pets are with us for little enough time, but when this time is cut short so needlessly, it is the closest thing to feeling broken hearted that I have ever experienced. Yes, it's good to give him a comment and assuming there are no deceptive camera angles then he looks exactly the same height to me as he does to you and Rob! Rob will have considered that and so this was on my mind when I was working out his height, you may well have had a little faith in Rob too, as well as yourself! I honestly think that the bottom of Alex's forehead is at Rob's 5'6.75" level (if they were both stood up straight) and with the height of foreheads being between about 4 - 4.25 inches, then Alex's height is therefore about 5'11"! I am having a good weekend thankyou, we have gone away for a couple of days to a holiday home just outside Huddersfield, it is actually near the Emley moor mast which is the tallest structure in England! We can also see it just outside Pontefract, which is over 20 miles away! ðŸ�© Is with us of course and the football is going well, at the moment! I hope you are having a good weekend too Sandy! @ Nik - Thank you! I found him in the early hours of the morning as a 'Random Celeb'! It was the first time I have seen a 'Random Celeb' pictured all on his lonesome; all the other ones I've seen have been with Rob! I found a single solitary picture of Alex via the 'Random Celeb' route, but sure enough, there is a lovely, detailed picture here showing Alex with Rob.... and a few mystery people! This is fabulous evidence that Alex is 5ft11, without a shadow of a doubt! 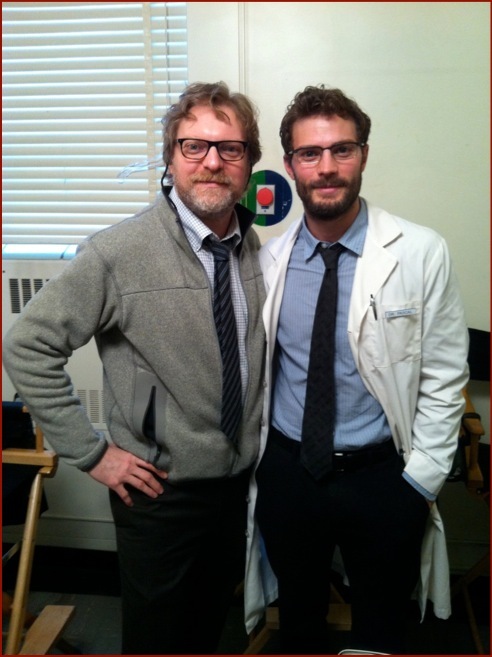 Editor Rob: I suppose that's good news for Jamie Dornan, he can get put up to over 6ft now 5ft 11 Alex with Jamie. Rob, how tall is the dude on the left?